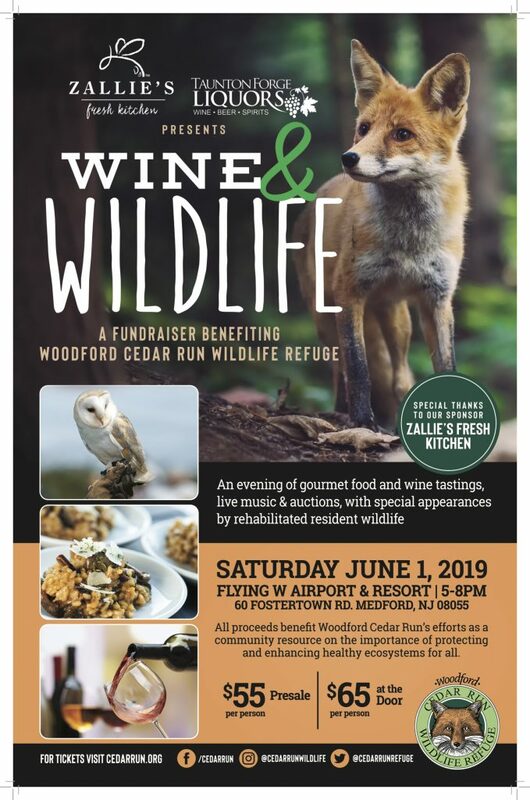 18th annual “Wine and Wildlife” fundraiser will be held on Saturday, June 1 from 5 p.m. to 8 p.m. at Flying W Airport & Resort, 60 Fostertown Road, Medford, NJ. Guests are invited to enjoy wine samplings provided by Taunton Forge Liquors and amazing food pairings by Zallie’s Fresh Kitchen while you browse through our wonderful auction baskets, bid on our silent auction and participate in the live auction. Music provided by the Lonesome Turnpike Ramblers, in the company of Cedar Run’s Wildlife Ambassadors (owls, hawks, and vultures). Learn about our history and how we serve the community we all love! Tickets are available for $55 through May 27. Afterward, tickets will be $65 in at the door. You must be 21 years of age or older to attend this event. Tickets can be purchased online at www.CedarRun.org or by calling (856) 983-3329. This event is sponsored by Taunton Forge Liquors, Zallie’s Fresh Kitchen and the Flying W, but additional sponsorship opportunities are available. Contact Cedar Run for more information at www.CedarRun.org.